Oh Snap! The Friggin Amazing J.Ho Sketchblog...: Starts with a "Skele-" and ends with a "-tor"
Okay, strap yourselves in kiddies, it's gonna be a bumpy ride. And by bumpy I mean nerdy. And by nerdy, I mean Skeletor-related. I'll be the first to admit, this one is kind of a stretch. I took a look at the original toy and decided that I would interpret his dark blue body as chain mail, and using the moniker "Leo" as a theme, I integrated lion-related imagery into his armor to differentiate him from Skeletor proper. After that, his personality and background quickly fell into place. A not-so-brief note to the truest of He-Man die-hards--you will note that the character's ring is modelled after the glow-in-the-dark skull insignia ring that was included with the Trap Jaw and Tri-Klops action figures. The ring has no official backstory or copy attached to it--however the symbol on it has popularly become known amongst fans as the "Grayskull symbol," believed to be modelled after Castle Grayskull or the spirit of Castle Grayskull (a smokey skull-shaped apparition that appeared in several of the early mini-comics that were packaged with the action figures). However, this explanation still didn't quite sit right with me... the shapes projecting from the top of the skull insignia's head were too pointy to be the battlements of Castle Grayskull, and were also far too regular to be wisps of smoke as per the spirit of Grayskull. To my eyes, the projections looked far more like three demonic horns. While all that could be perhaps dismissed as me looking at the ring's visual cues too literally, something bothered me even more--the fact that the ring was included only with two of Skeletor's best-known evil warriors. Why were they the bearers of the mysterious rings? To make a long story long, I decided to go against conventional wisdom--the insignia is not a symbol of Grayskull in my interpretation. I don't claim to be an expert, and this is all just for fun, so I hope you'll all enjoy yourselves as the story of that insignia unfolds through the continuing profiles of my variant characters, moving from the classic Masters of the Universe line, to the New Adventures of He-Man, and beyond. PROFILE: Hailing from the world Infinita, and serving the God-King of Infinita, HIGH PRIEST LEO is an alien warrior-cleric of the highest order. He was born of the same process that created Skeletor--given demonic powers and a terrifying skeletal visage through dark spellcraft and ritual scarring. Armed with a Havoc Staff (the traditional weapon of Infinitan priests) and accompanied by his winged mount MANTICORE, there is no zealot more fiercely devoted than Leo, whose famed exploits in the name of the God-King have earned him the title "the Lion of Infinita." All who cross High Priest Leo's path will bow to the will of the God-King of Infinita. HAIL INFINITA! 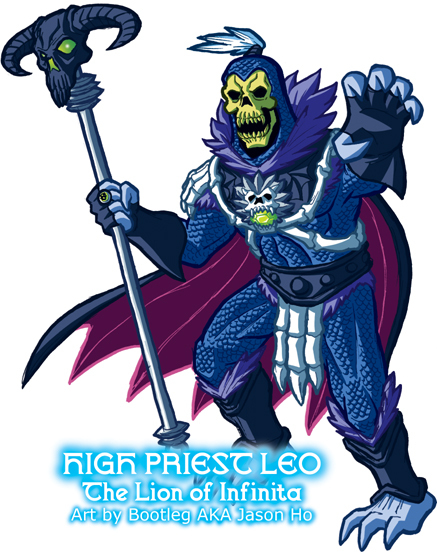 HISTORY: With no communications received from Eternia in years, Skeletor was declared a renegade, and the High Priest Leo was dispatched from Infinita to track down and report Skeletor's whereabouts. His vessel damaged by a meteor shower, Leo crash landed somewhere in the jungles of Eternia, and began the long trek towards Snake Mountain. Nearing the perimeter of Skeletor's Fortress, Leo spyed Trap Jaw and Tri-Klops standing guard. With little effort, Leo stepped into the open and bested them both. As Trap Jaw lay on the ground groaning in agony, his prosthetic arm torn from its socket, Leo level his Havoc staff at Tri-Klops. Tri-Klops's glaring red eye widened at the sight of Leo's ring, bearing the insignia of the God-King of Infinita--a triple-horned black skull. "W-wait--there's been a misunderstanding!" he stammered, as he fumbled through his belt pouch. Amused, the High Priest paused to see what attempt at bribery this Eternian could muster--though it did not matter, Leo would kill him one way or another. What Tri-Klops produced from his pouch was not gold or silver, but a blank ring. Tri-klops put it on his finger and held up his hand for Leo to see. "Hail Infinita! Hail the God-King!" Tri-Klops cried. With a gleam of demonic energy, the triple-horned skull insignia materialized on Tri-klops's ring. "We've been waiting for you, my lord." With great effort, Trap Jaw clumsily managed to put on a similar ring on his remaining good hand. He muttered the same invocation, and an identical insignia appeared on his ring as well. Leo stayed his hand, somewhat disappointed that he would have to spare these two Eternian wretches. "Tell me everything you know," Leo demanded. In the distance, a stealthy barbarian and his dreadlocked young ward strained to hear the conversation between the High Priest, the swordsman, and the cyborg. When the invader fell from the skies, they had shadowed him silently, ultimately tracking him to the fringes of Skeletor's lands. The barbarian decided that they could no longer risk detection--it was imperative that this development was relayed to his allies in the capital. I wish he had been a mash-up of Leo from TMNT and Skeletor... Skeleo!